Live, Love, Laugh and RENOVATE! 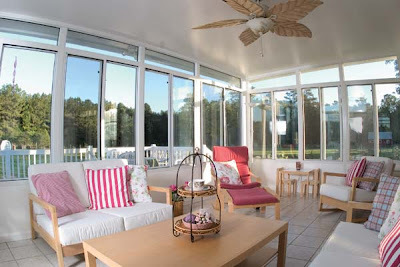 : LOVE IT TUESDAY: Sunrooms!!!!! I'm not sure where my recent obsession with sun rooms has come from... I just absolutely LOVE THEM and totally want one!!!!! I love browsing through the MLS listings in our area looking for future houses (not that we have any desire to move anytime soon). And lately there have been a lot of super cute houses on the market with AWESOME sun rooms and I WANT A SUN ROOM!!!! haahhahaha!!! I told Ryan that our next house will have a sun room!!! (that's if I can't convince him to build a sun room off our house now!!!). I love this sun room that bloggers Sherry and John from Young House Love have at their house. Its just so fun and airy!!! 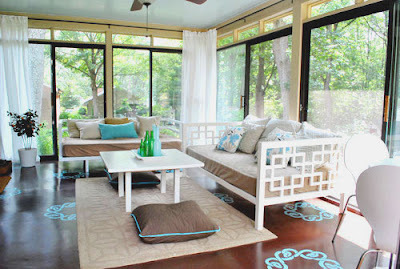 Or even this sun room!! Mind you I would add curtains to cheer it up a bit! My dream would be to build a sun room off our backdoor where our current patio area is. But realistically that will never happen. In fact I also have a dream of building a garage there and building a loft bedroom above the garage.... OHHH if we did that we could transform our current bedroom into an awesome sun room!!! HAHAHAHA I have so many ideas... none of them will probably materialize with our current house though. I don't think we would see the money back in that type of investment... oh well.. here's to dreaming!!!! Happy Concrete oops Thanksgiving Weekend!